This is a Sponsored post written by me on behalf of Murphy-Goode Winery for SocialSpark. All opinions are 100% mine. 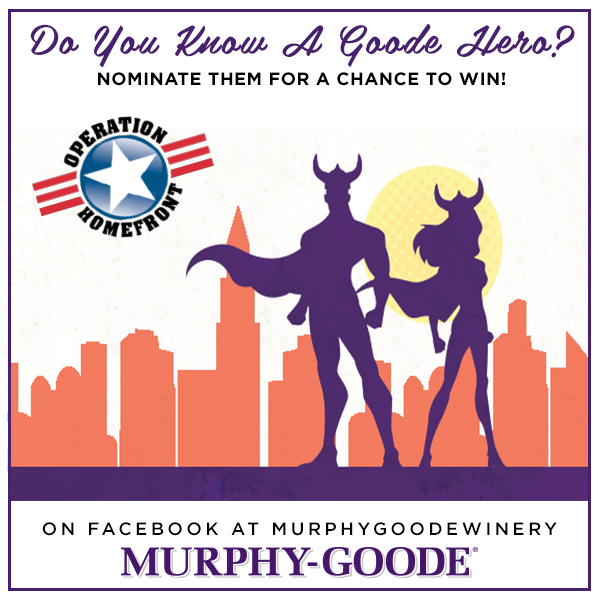 One of the wine makers I enjoy from time to time is Murphy-Goode, and they have partnered with the people at Operation Homefront to assist our men and women in uniform and to help to give back. Murphy-Goode creates a special blend wine each year and donates 50 cents from every bottle. The average amount Murphy-Goode has donated each year…? About $300,000. That’s a lot of giving back! Operation Homefront is a National non-profit organization that provides emergency and financial assistance to the families of service members and wounded warriors. My dad was a 22 year, career Marine and my oldest son, Devin is in the Navy, so I am a proud supporter of our military and their families. In addition to our heroes in the military, there are heroes among us in our communities. They are the every day hereos we can find in our teachers, nurses, police and first responders. They are also the people who tirelessly give back like my friend, Casey. I think Casey as an every day hometown hero. She works tirelessly to help the homeless in Long Beach, CA. She works with churches and non-profit organizations to create food drives and collect clothing and blankets for shelters, but she also just goes out on her own to streets and parks, giving out homemade sandwiches, personal hygiene items and coats. She volunteers her time and energy and shares her resources, doing what she can to help wherever she sees a need. I nominated Casey in the A Few Goode Heroes Contest that Murphy-Goode is currently running. There will be monthly winners of the contest who will receive a $500 donation to their favorite charity and Murphy-Goode will make a matching donation to Operation Homefront. One grand prize winner will win a 4th of July BBQ in their hometown, sponsored by Murphy-Goode and catered by their Grill Sargeant. 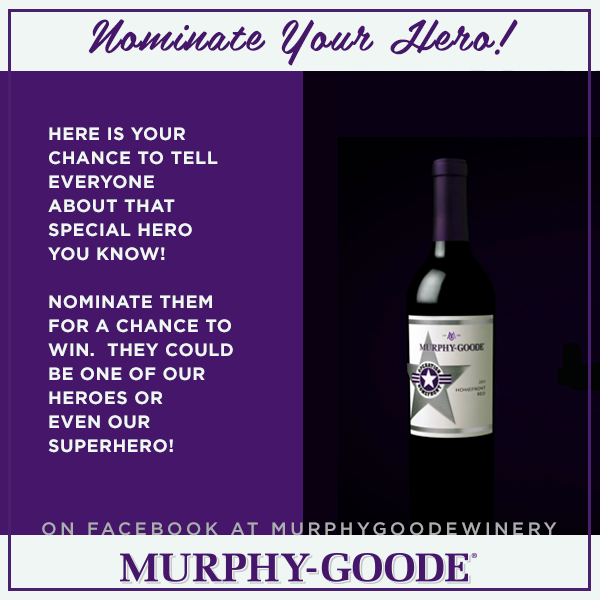 To nominate your every day hero and enter them in the contest, be sure to like Murphy-Goode on Facebook and then simply write up a quick 250 word essay on why you chose your hero and how they are making a difference in their community. Easy! Thank you to Murphy-Goode and Operation Homefront. I, for one, will be buying plenty of their Homefront Red Blend in order to do my part.